Papers: In the Champ and Bennett Champ Clark Papers, 1853-1973, 25 linear feet and 3 oversize volumes. 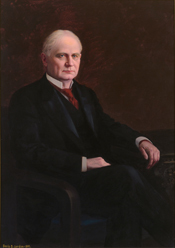 The bulk of the Champ Clark materials were created during his tenure as a congressman. They reveal the inner workings of Capitol Hill, chronicle partisan party politics at the state and national levels, and document the congressman's activities on the Chautauqua circuit, in the political arena, and as a family member. There is considerable correspondence relating to his candidacy (and defeat) for the Democratic presidential nomination in 1912. A finding aid is available in the repository and online. Papers: 1905-1915. 1 foot. Political correspondence, some relating to his unsuccessful bid for the Democratic presidential nomination in 1912. Unpublished finding aid in repository. Restricted. Papers: In the James Gordon Hackett Papers, 1788-1952, 196 items. Correspondents include James Beauchamp Clark. Papers: In the Fred Thomas Dubois Papers, 1886-1930, 26 linear feet. The papers include a scrapbook relating to Champ Clark's campaign for the 1912 Democratic presidential nomination, which Fred Dubois managed. A finding aid is available in the library and online. Papers: In the Charles J. Bonaparte Papers, ca. 1760-1921, 80,000 items. Correspondents include Champ Clark. A finding aid is available in the library. Papers: In the T. J. J. See Papers, ca. 1887-1960, 53 linear feet. Correspondents include Champ Clark. Papers: In the Lloyd Cassel Douglas Papers, 1900-1954, 6 linear feet and 2 oversize volumes. Other authors include Champ Clark. A finding aid is available in the library. Papers: In the Elbridge H. Duff Letters, 1902-1903, 12 items. Other authors include Champ Clark. Clark, Champ. The Country Editor. Washington: [Government Printing Office], 1898. ------. Cuba. Washington: [Government Printing Office], 1898. ------. Hawaii. Washington: [Government Printing Office], 1898. ------. My Quarter Century of American Politics. 2 vols. New York: Harper, 1920. ------. The President and the Tariff. Washington: N.p., 1910. Hollister, Wilfred R. and Harry Norman. Five famous Missourians: Authentic biographical sketches of Samuel L. Clemens, Richard P. Bland, Champ Clark, James M. Greenwood, and Joseph O. Shelby. Kansas City, Mo. : Hudson-Kimberly Publishing Co., 1900. Morrison, Geoffrey Fahy. "America's Ring-Tailed Roarer: Speaker of the House Champ Clark." Gateway Heritage 10 (Spring 1990): 56-63. ------. "Champ Clark and the Rules Revolution of 1910." Capitol Studies 2 (Winter 1974): 43-56. ------. "A Political Biography of Champ Clark." Ph.D. diss., St. Louis University, 1972. United States. 66th Congress, 3d session, 1920-1921. Champ Clark (late a Representative from Missouri) Memorial addresses delivered in the House of Representatives of the United States. Sixty-sixth Congress, third session. March 3, 1921. Prepared under the direction of the Joint Committee on Printing. Washington: [Government Printing Office], 1922. Webb, William Larkin. Champ Clark. New York: The Neale Publishing Co., 1912. ------. "The Work of the Democratic House." North American Review 194 (September 1911): 337-43.